Due to prohibition era all alcohol is bootleg and you will have to smuggle in your own. as there are no drinks or food on sale. 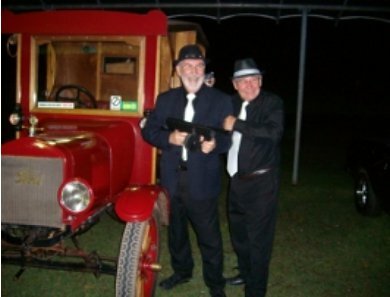 Tommy guns and all other guns welcome please ensure safety is on. Dress: Formal as the 1920’s prohibition era. 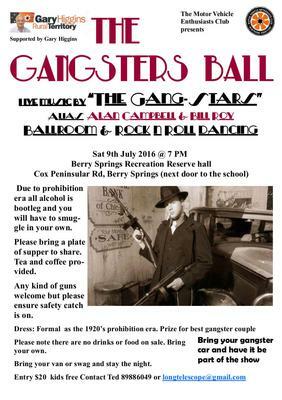 Prize for best gangster and moll couple. available nearby at Lakes Resort. For accommodation book well in advance. My partner and I have been to this event twice. Both times were great. Everyone was dressed up as high class gangsters. 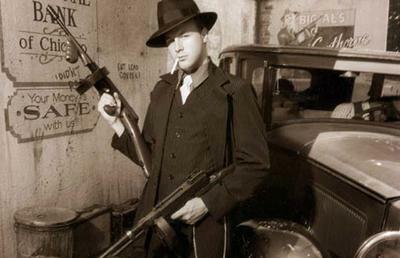 The standard fashion accessory was a Tommy gun. For the ladies it was a Derringer or a small pistol. They had them in garters, stuck in their cleavage and some ordinary types even had them in their handbags. The band was great, they would play anything. Plenty of room with a gigantic dance floor. A ripper night even for those that did not dance. And at $20 a cheap night out.